The Try Out Galaxy is a galaxy that has all of the powerups in one galaxy and that you could play around as much as the player wanted and not have to accomplish anything because there are no power stars in this galaxy. 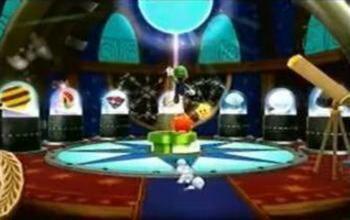 and another platform with a Yoshi egg, and Yoshi's power ups, blimp fruit, dash pepper, and bulb berry. For each power up you have another planet to try out each power up. If the power up finishes when you touch a launch star the planet for that one will be closer and you will not require a launch star, you will just jump to the planet. These are my ideas and examples of what I am referring to. You start in a block of Supermassive galaxy but resized, and at the edges there are power ups. Beside it there is another block (but a bit smaller) with a Yoshi egg, and power ups. Fire flower: Take the launch to a planet with those boxes that break with fire, there is a launch star to leave the planet and go to the next. And in another planet there are lots of octogoombas. There is a launch star to leave the planet to the starting platform. Rock mushroom: You can't use a launch star for this power up so lets put a ramp (the ramp rock mario uses to go faster) and make a series of those pin monsters. At the end make a launch star to make you go back to the start. Cloud flower: Launch star to a bunch of clouds. Launch star to go back. Rainbow star: Launch star to a planet full of enemies. Launch star to go back. Bee mushroom: Launch star to stick walls and floating flowers. Launch star to go back. Boo mushroom: Launch star to some random planet with boos and octoboos, and walls you can go through. Launch star to go back. Spring mushroom: No launch star, a planet where you have to jump to get to the launch star to go back. Spin Drill: No launch star, some planet where you have to dig with lots of diggas. Launch star to get back. If possible Red star: Go flying to and through planets. Get back with a launch star. If possible Ice flower: Go to a water planet and start skating till a launch star. Blimp fruit: Fly with blimp fruit to a another planet. Post ideas for this please. Dash pepper: Run upwards a ramp and take launch star to get back. Again, post ideas. Bulb berry: Walk over hidden platforms, get to launch star and go back. Again, post ideas. And when you feel like getting the star and leaving, just jump to another planet and get it. This galaxy [for now] will be in a pipe located in the room with the powerups.